How can we make danger more palpable? I was clearing my e-mail inbox, and came across this link to a news article on the BBC website. It illustrates a very common marketing trick, but with a twist. Products have a mixture of tangible and intangible attributes. Tangible attributes can be seen and felt and, thus, offer a good clue about the quality of a product. For instance, a baked product sprinkled with sugar tells me that this is a sweet treat. If I am looking for a sugary snack, I could buy this one. Conversely, if I am after a savoury treat, I had better look elsewhere. So, tangible attributes reduce the risk of a purchase. Intangible attributes, on the other hand, can not be seen or felt. For instance, I don’t know how good a massage will be until I try it. Because of this inability to assess the intangible characteristics of the product, there is always some risk involved in the purchase. Consequently, I will need some sort of reassurance about the quality of the product before I spend my money on it. Knowing this, marketers give us clues about the quality of the product that they bring to the market. For instance, a detergent manufacturer claims that it has discovered a new component that makes its washing powder more effective. I can’t really assess the validity of these claims until I have tried the powder (and, even then, it may not be possible to assess the claims – for instance, if the innovation is about making clothes last longer). Thus, I hesitate about paying the additional price for the new, improved version of the product. In that case, the detergent manufacturer may signal the innovation by adding blue particles to the washing powder. The blue particles in themselves are not part of the technical innovation, but it conveys the message that the washing powder’s formula has changed. Such ‘physical evidence’ will make the innovation more tangible, and I will feel more comfortable about spending the additional amount for the new ingredient. In the news article mentioned at the beginning of this section, the opposite has happened. 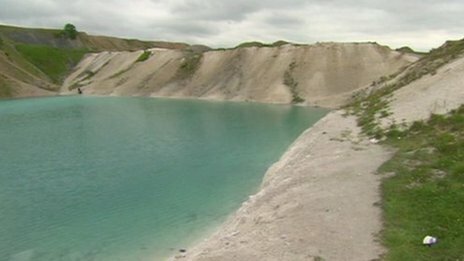 Apparently, there is a lagoon in the north of England that is very dangerous for humans. The water has a pH level of 11.3 (not much lower than bleach, with a pH level of 12.3) and, therefore, it can cause severe health problems. The trouble is that the dangerous pH level is not tangible – on the contrary, the water has a beautiful blue tone, akin to that in tropical destinations. 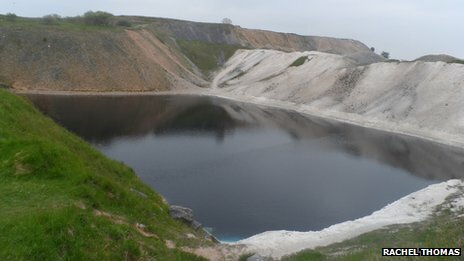 Hence, to deter people from swimming the lagoon, the local council has dyed the water black. Not only did the council give the water an unnatural colour, to convey the message that there is something wrong with it, but it chose an unappealing colour (to me, the black colour reminds of oil spills). So, they have increased the tangibility of the harming elements of the water to make people stop using it. This initiative made me think about another type of harmful behaviour: over sharing online. It has been noted on many occasions that many of us who value our privacy and are concerned about the data capture, data storage and profiling initiatives of companies like Google or Facebook, will still go on to share highly personal and sensitive information online. Maybe we need a mechanism to make the dangers of over sharing more tangible – a simple and effective mechanism, like dying dangerous water a scary colour black. Do you agree? And what would that mechanism be? Posted on July 23, 2013 July 19, 2013 by anacanhotoPosted in Marketing in everyday lifeTagged Changing consumer behaviour, Consumer behaviour, Intangibility, Over sharing, Privacy, Tangibility. great example and one I intend to plagiarise I am afraid. The issue you raise is really important. I am very careful what I share on social media when it comes to say, social events. However, others attending the same events are not so careful and I find that often a whole social occasion has been broadcast on the internet including photos of children, grandchildren etc. When we choose a password for a social or communication site the password is given a rating as a matter of course, showing the user how strong it is. Something along those lines may be a start – so when posting photos the user is prompted to answer a few simple questions such as – ‘do you have permission from those in the photo to upload’? or ‘would other people in these photo’s be happy/upset to see themselves on this site?’ Perhaps a colour coding from No problem to likely to cause offence could be implemented. We cannot use pictures of our students on our social web without their written consent. people are becoming more sensitive about this issue since it has become clear that prospective employers are reviewing social media to get a more detailed profile of job applicants. I know what you mean about pictures of young ones (or yourself, for that matter). I like your idea of the ‘strength indicator’ / permission question because it starts from the assumption that you should not share and you need to make a conscious decision to post it. What about a picture of a pair of goggly eyes peering at you?! Though, I suppose it is not in the interest of Facebook and the like to alert us to the downside of using their services.